Bevo XIV has been the Longhorns' mascot since 2004. Longtime Texas mascot ‘Bevo’ is reportedly suffering from a ‘life-threatening condition,’ and Monday, there was a further update regarding his status. 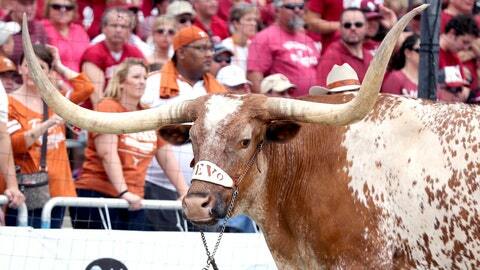 Bevo XIV was unable to attend the Red River Rivalry game Saturday against Oklahoma, a tilt that saw the Longhorns upset the Sooners 24-17 in Dallas. The same Twitter account sent along his encouragement before the game. It appears as if the Longhorns listened.